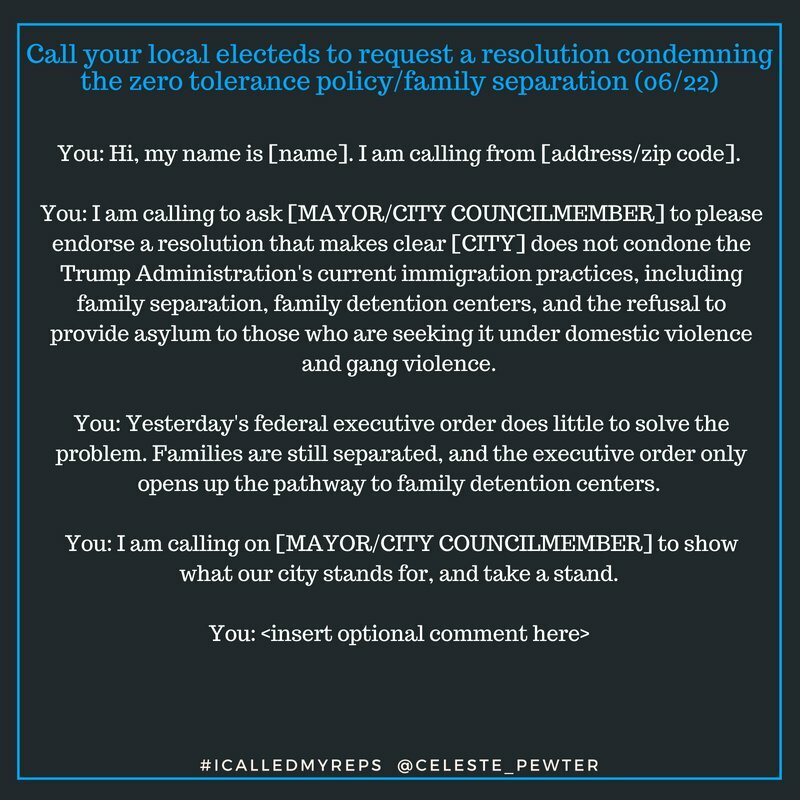 Call your MoCs and demand that Team Trump make reuniting the 2,000-odd migrant children with their families their top priority. Job one, dammit. And keep urging your electeds to resist this fucked-up family separation policy, which is nowhere near dead yet, regardless of what Team Trump wants you to think. You are well aware that Team Trump tried to push an insanely harsh and utterly indefensible policy of breaking up migrant families at the southern border of the United States. Since they started enforcing their sick new policy, more than 2,000 kids have been parted from their parents, and some have been sent more than 1,000 miles away from where they entered the country. Trump tried to take the heat off himself by signing an executive order that would supposedly keep the families together. What it actually does is flout an existing protocol that stops the government from detaining families with minor children for more than 20 days. What Team Trump evidently wants is the power to hold migrant families indefinitely, which, no. Just, no. Anyway. 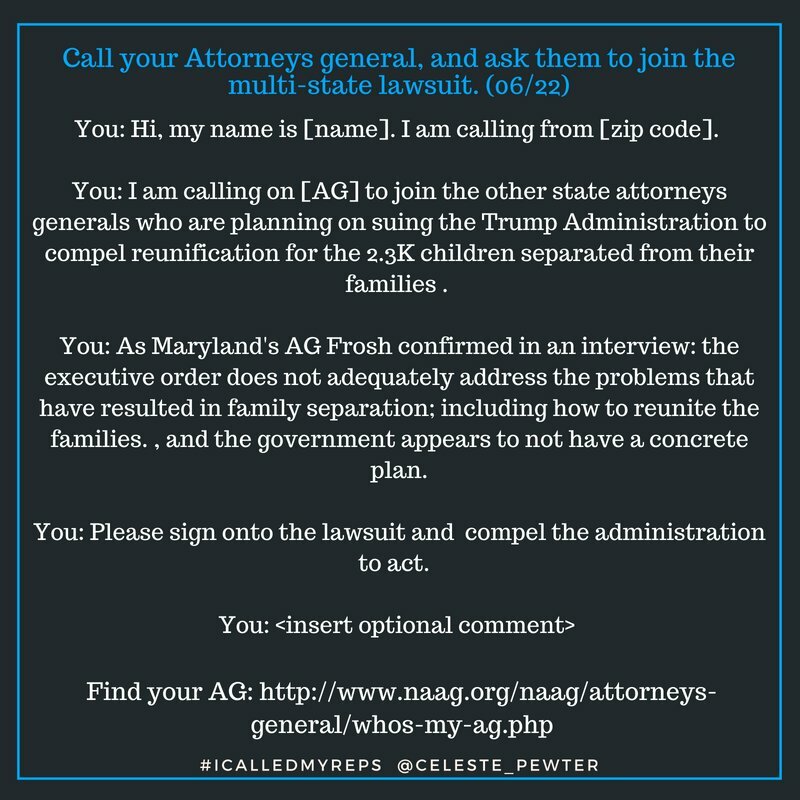 Trump lashed out soon after signing the EO by pulling a ridiculous stunt showcasing who he called “Angel Families”–survivors of people who were killed by immigrants, evidently in an attempt to bolster his notion that immigrants are more likely to commit crimes. This flies in the face of what we know. Undocumented immigrants actually commit fewer crimes than native-born citizens. When you think about it, it makes sense–they can’t afford to make even one tiny mistake for fear of being deported. The larger point here: More than 2,000 kids are still without their parents, and Team Trump is not giving the matter the concern it deserves. Reuniting the kids with their parents should be Job One right now. That’s not how they’re acting. So, where do you come in? Once you’ve done that, then tell your MoCs that you want the government to prioritize reuniting immigrant families. Tell them that’s more important than stopping immigrants and asylum seekers who are trying to cross the border. 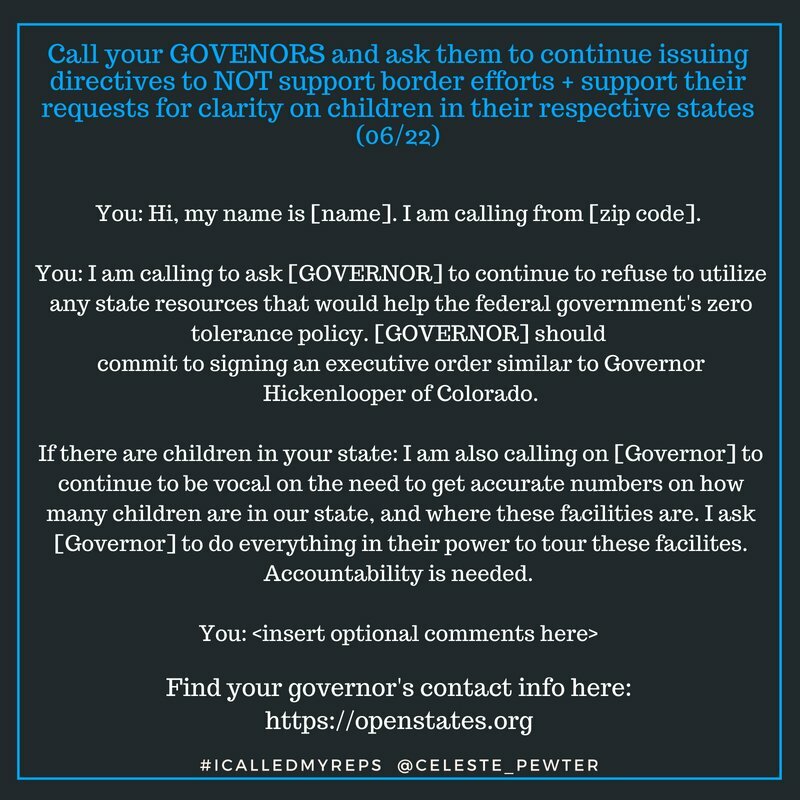 Tell them you want the government to divert resources as needed to make this happen, and tell them nothing else should happen, border-wise, until EVERY kid is back with his or her parents. governor (also from Celeste Pewter; scroll down for info on how to support her work). can support her in other ways. experience using the #ICalledMyReps hashtag.